Ludwig van Beethoven Teddy Bear MUSICAL handcrafted by Hermann-Spielwaren Coburg GmbH. Classic Music Composer German Mohair with musical movement that plays "Fur Elise", Bagatelle No. 25 in A minor. The song was written for a lady called Therese (nicknamed Elise) that Beethoven wanted to marry in 1810. Hermann Spielwaren create beautiful Mohair teddy bears in Coburg, Germany in the traditional style. They have produced teddy bears for the world for three generations. Classic Music Series, Hermann-Spielwaren Coburg GmbH. 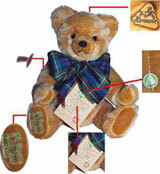 Each bear comes with a Numbered Limited Edition Certificate. Ludwig van Beethoven Teddy Bear is a delightful, fully jointed 15.75 inch Mohair Teddy Bear, which is traditionally stuffed with excelsior. #19238-9. Musical voice, plays "Fur Elise". Bagatelle No. 25 in A minor (WoO 59, Bia 515) for solo piano, commonly known as "Fur Elise", is one of Ludwig van Beethoven's most popular compositions. Composed‎: ‎27 April 1810. Published‎: ‎1867. Limited Edition of 500 pieces. Not in stock - Reserve yours TODAY!